Antigone's mother is also her grandmother, her brothers have killed one another, and today, her dogmatic uncle is entombing her alive, but Carson won't let Oedipus' daughter mope about with a frowny face, oh no. This heretic, gutteral translation of Sophocles provides us with the strongest Antigone I've ever encountered, one whose humor makes her both more and less human. With text blocks hand-inked on the page by Anne Carson and her collaborator Robert Currie, Antigonick features translucent vellum pages with stunning drawings by Bianca Stone that overlay the text. Anne Carson has published translations of the ancient Greek poets Sappho, Simonides, Aiskhylos, Sophokles and Euripides. Antigonick is her first attempt at making translation into a combined visual and textual experience. 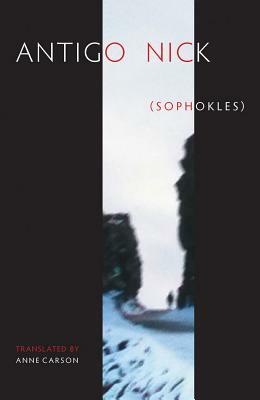 Sophokles luminous and disturbing tragedy is here given an entirely fresh language and presentation. Thoroughly delightful.